Summary: Gertie, the youngest of the five daughters in the all-of-a-kind family, is eager to help get ready for Hanukkah. Her mother and older sisters grate potatoes, chop onions, and fry the latkes, but Mama says Gertie is too young to handle sharp kitchen utensils and hot oil. Gertie eventually has a meltdown and is sent to the bedroom, where she hides under the bed she shares with her sister Charlotte. When Papa comes home, he invites her to help him light the first Hanukkah candle. Suddenly, everything feels right again, and after Gertie and Papa light the candle together, the whole family sits down for a Hanukkah feast. Includes a glossary, a note from the author with more information about the original All-of-a-Kind Family series by Sydney Taylor, and a note from the illustrator. 40 pages; ages 4-8. Pros: I was delighted to see a new book telling about one of my favorite fictional families from my childhood: the all-of-a-kind girls growing up in a tenement in turn-of-the-century New York City. 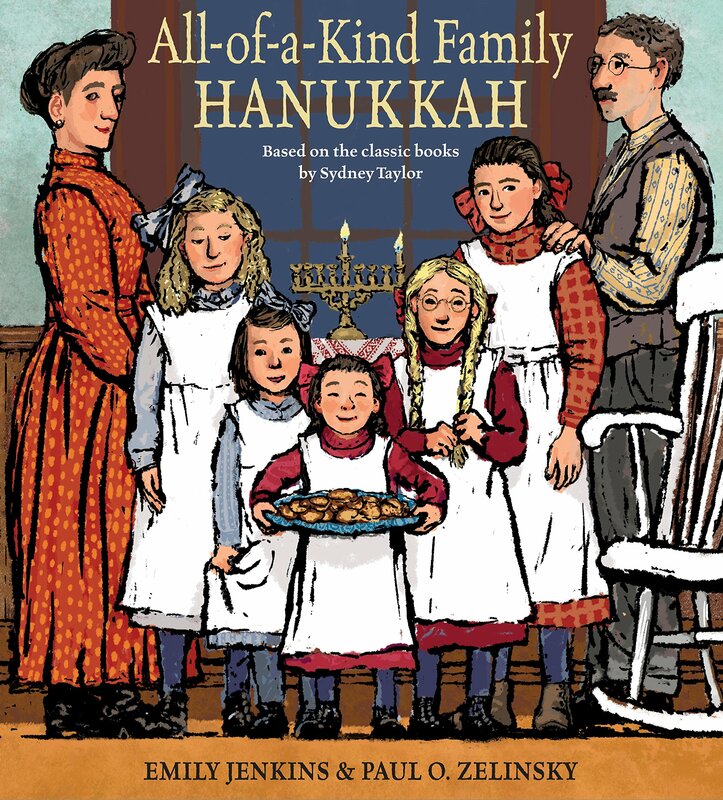 Everything I needed to know about Jewish holidays I learned in a Sydney Taylor book, and this beautifully illustrated picture book continues that with a sweet introduction to Hanukkah. Cons: I have mixed feelings about the revival of this beloved series in the hands of a new author and in picture book format.